Still retails for the same price as I bought it in 2009 - even on ebay!! I got it at 50% off too, so it was a pretty good deal for a locked pin water resistant (200m) watch! Only €30. Plus, if I need to, in future, I can change the strap really easily buy putting in a new one - though I might head down to the store and buy a few straps just in case this one lasts me for 10 years and then decides to break! 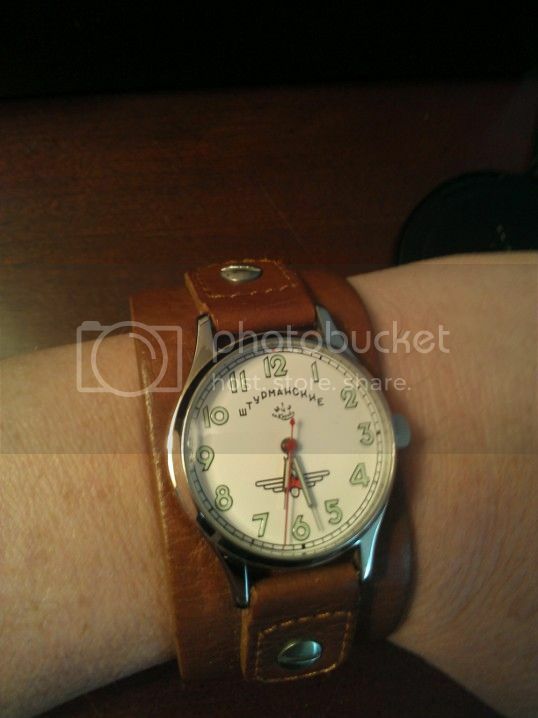 So I'm looking for a new watch to ask the inlaws for for Christmas and have been looking around for something interesting. I like both high tech and motion wound skeleton watches preferably silver/steel or black color. I have a $500 dollar budget. Anyone have an interesting suggestion? Below are my current top 3 choices. EDIT: NM, nothing to see here. Does anybody have any experience with watch winders? I have this exact style of winder but mine has different branding. You can find them for sale everywhere. Supposedly they are pretty cheap and the motors tend to become noisy over time. That said, I've had mine for over five years and it's still going strong. I use mine for a couple of "japan made" automatic dive watches that I bought back in the day. I like it a lot although I haven't had it long yet. I do have a minor complaint about how loose it feels when I set the time... don't know enough to know if it is just me or something I should worry about. I've never really made by mind up about winders. On the one hand it's a pain to have to get an automatic going once it's stopped, but on the other I'm not sure I like the idea of putting 24/7 wear on the movement even when it isn't on the wrist. I suppose I might for a moonphase or perpetual calendar as they're fiddly to set. I heard that it's worse for the movement on the watch to let it sit. The lubrication tends to pool or whatnot. A little noise I can handle as I don't keep them where I sleep. 5 years is longer than I expected it to last. If I keep adding it's going to be annoying to wind a bunch of watches everyday or so. Well one sign of a quality watch is the movement of a crown. 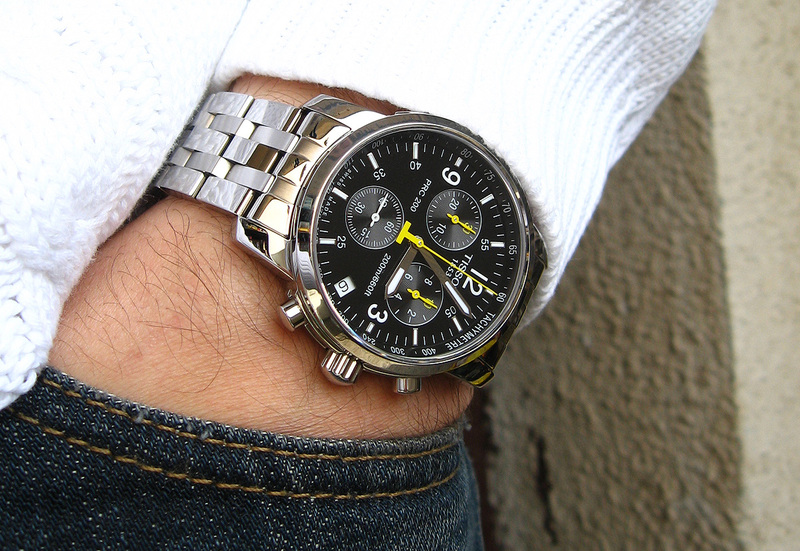 Fossil isn't known for making the best watches, but if you like it, rock it. Wear it with pride. You aren't going to be fiddling with the crown that often anyway. Orient Mako. 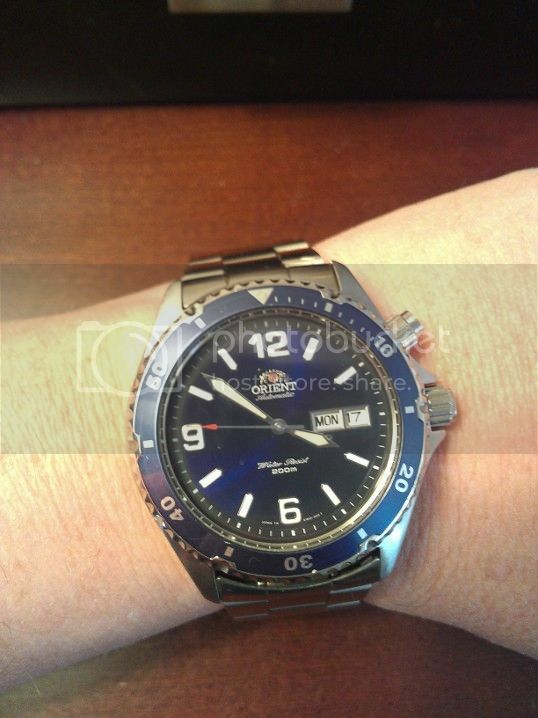 This is a really solid diver, especially for the price. Sturmanskie Yuri Gagarin 40th anniversary reissue. Of the various reissues, I think the 40th anniversary was best & is the closest replica to what he wore. ^ Nice varied collection. What's the yellow/orange dial watch and how does that work? Interesting! Thanks! You read that one straight down the red line: hours, minutes, seconds. So, the time in that pic is coming up on noon/midnight -- 11:56 +35 seconds. It's one of the cheapest watches that I own, but it definitely draws the most comments from strangers. I'm pretty sure I ordered it from watchismo.com. The guy who runs that site sells some really interesting pieces, design-wise, and seems not to care at all if they're quartz or mechanical movement. It is really neat how it works I just now have to decide if I can handle the glitz that comes with it. @Conejote - Nice collection! I too am a big fan of the Orient Mako dive automatics. I have one with the yellow dial but that blue is beautiful. That Russian replica looks great; wish I knew more about Russia-made watches. 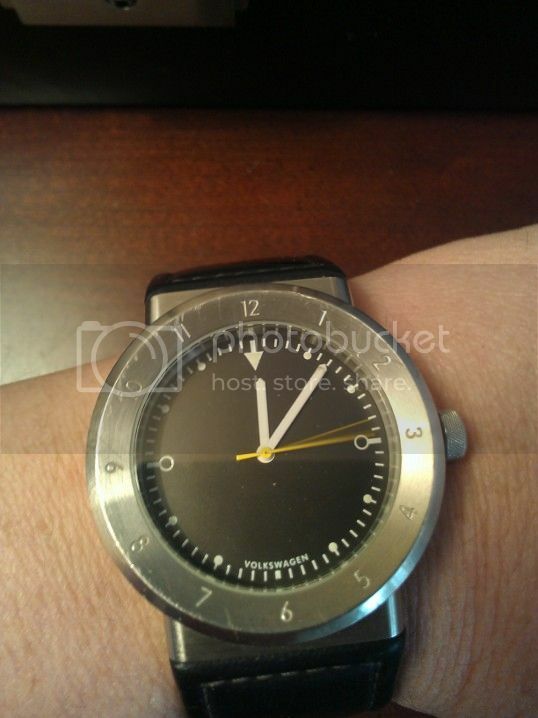 Yeah, I went through "that" phase were I wouldn't have anything to do with quartz movement watches. And if I bought quartz, it was usually a higher end digital Casio. Those two retro quartz watches are outstanding, though! Thanks for the photos! I am pretty sure MonoCheli is from the future. Thanks, ringsnort. I really dig those yellow dial Orient divers. 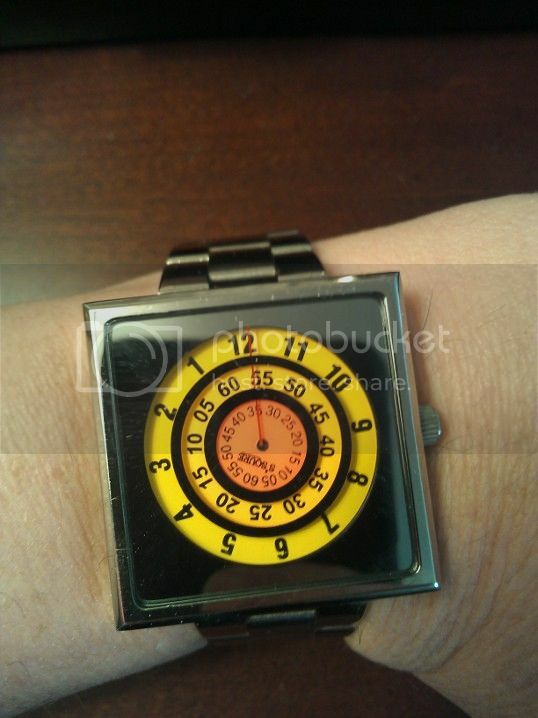 I picked up this awesome limited edition timepiece at some resort I was at recently. That one's a keeper! Those modern big dial "mickeys" are great! I bet you did. It never occurred to me to even look at watches when we were there several years ago. I couldn't help myself with this. Not the fanciest thing, but I am looking forward to getting mine. I really like that watch, it just went on my want list. Thanks for the heads up! I'm all over that Rosewood + Stainless combo. Nice watch AP. Love those Citizens. This week I've been going to my indestructible Seiko Orange Monster on wpjean Shark Mesh bracelet with Omega ends. I'm gonna have to go with the maple an black. I like the silver, but I always buy silver watches. The collection deal is a great price and I was a bit tempted. My current watch. Again, nothing fancy. I'm still planning on getting the Rosewood + Stainless combo but the more I look at the watch, the more I am bothered by the dial. I have very specific tastes when it comes to dials. It's really starting to bug me more and more that they used the initials OG in addition to the words Original Grain, and then put them both in completely different fonts (script and times new roman). Script on a watch dial is just a no-no for me. I would have stuck with OG at the top and put the date above the 6 to flesh out the bottom half of the dial. If I didn't love the wood/metal combination so much, the dial would be enough to turn me off to the watch. As it is, it looks like I'll be doing a dial mod. Might be getting this for my birthday... anyone try it out yet?